I put up new recipes each month and am always looking to learn about new recipes from others. Email me if you’d like to contribute to this page. You can go straight to the grain you want to cook with, or start with the basics. Enjoy! Toast the wheat berries (optional). Preheat the oven to 375°F. Spread the wheat berries on a baking sheet and toast in the oven for about 10 minutes, or until lightly colored and aromatic. Cook on the stovetop. Transfer the wheat berries into a sauce pan and add 3 cups of water and a big pinch of salt. Bring to a boil, reduce heat to a simmer, and cover the pan. Check for doneness. At about 30 minutes, start checking for doneness by scooping out a few berries and carefully tasting after they’ve cooled a bit. They should be chewy but not tough. If not quite done, continue cooking and check the wheat berries every 5 minutes. You may need to cook them up to 25 minutes longer depending on the exact variety of wheat berry you purchased and their age. Drain. Drain the berries in the strainer and transfer to a bowl. Toss with a splash of olive oil and a pinch of salt. Store in refrigerator. If not using right away, store the cooked wheat berries in a tightly covered container in the refrigerator for up to a week. Gently reheat in a frying pan over low heat until hot, or serve at room temperature. Check the pot on occasion to be sure there is enough water. Add more hot water as needed. For extra flavor, toss warm wheat berries with a splash of olive oil and a pinch of salt just after draining. These additions, plus lemon or vinegar, make them ever more flavorful. 1. Cook wheat berries in lightly salted water until soft, about 45 min. Let cool. 2. While berries are cooking, prepare dressing by juicing 2 oranges. Remove mint leaves from stems. If you don’t have a blender, mince the leaves. If you have a blender, put all dressing ingredients and pulse. 3. Dice carrots, spinach, green onions. Place in large bowl. Pour dressing over these ingredients. 4. Once wheat berries are cooled, mix with other ingredients. Combine wheat berries and vegetable broth in a large saucepan. Bring to a boil, then reduce heat to low. Cover and cook until tender, about 50 minutes. Drain off excess liquid. Set aside. 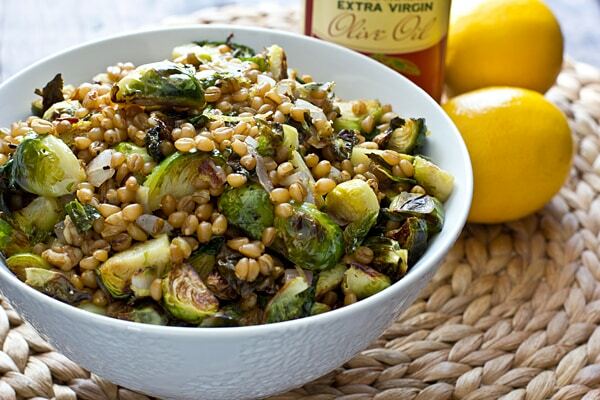 While wheat berries are cooking, start Brussels sprouts. Toss Brussels sprouts, shallots, and 1 tablespoon of olive oil in a large bowl. Transfer to a rimmed baking sheet. Bake for 15-20 minutes or until browned, stirring halfway through cooking time. Remove from oven and stir in walnut pieces (they will toast on the hot baking sheet!). Whisk together lemon juice, zest, remaining oil, salt and pepper in a large bowl. Add wheat berries and roasted vegetables; toss to combine, then serve. 1. Mix all dry ingredients for pancake, then add the wet ingredients. The batter should be viscous such that it sticks to your stirring implement, but not to the point where it’s ripping when you pull up your implement. Add water if it seems too thick. Let the batter sit while you make the sauce. 2. Put all sauce ingredients into a blender or food processer and puree. Add water, a teaspoon at a time, if it does not blend easily. 3. Heat a skillet to medium-high. Add butter or oil. When the skillet is heated, pour a cup of batter onto the skillet. Leave it until you see bubbles pop on the surface. Once you see the bubbles, flip the pancake to cook the other side. Repeat for the rest of the batter. 4. This can be eaten warm or cool. You can also cut the pancakes into slices to make into a finger-food. This is a great fall and winter salad when mushroom season comes around. Any kind of mushroom works for this recipe. You can add garlic and replace the olive oil with butter if you prefer. 1. 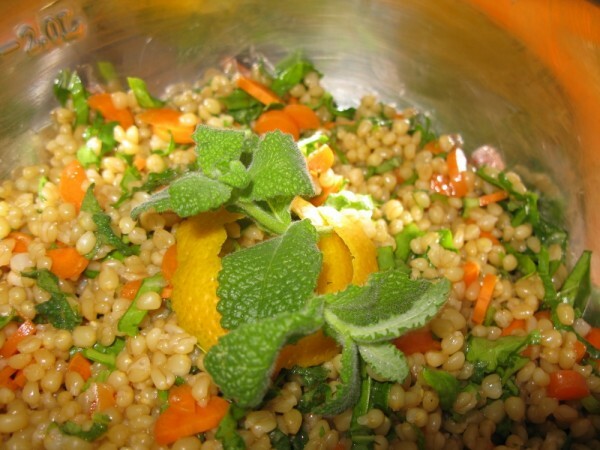 In a large pot, combine the wheatberries in 2 1/2 quarts of salted water and cook for approximately 50 minutes. 2. Heat the olive oil in a skillet over low heat. Add the onions and cook until translucent, about 3 minutes. Raise heat to medium-high, then add mushrooms. When mushrooms are slightly browned, add the white wine. Simmer for 5 minutes. Add rosemary and sage, stir for 1 minute. Add the onions and mushrooms to the wheatberries in a medium bowl. Season with salt and pepper to taste, and serve warm. Cook the parsnips in the water until they are tender but not mushy. Remove the parsnips but retain the cooking liquid. Mix the parsnips and rye berries and set aside where you can keep them warm. To make a thin-to-medium sauce, melt the butter and stir in the unbleached white flour. Cook over medium heat until golden. Whisky in the milk and parsnip cooking liquid. Cook and stir over medium heat until mixture is hot and smooth, the stir in all but 2 tablespoons of the cheese and the salt. Stir until the cheese melts. If the sauce seems thick, thin it out with a little more milk; for this recipe, the sauce should not be too thick. To serve, pour the hot sauce over the warm rye and parsnips and sprinkle with the remaining cheese and the chopped chives. Serve very hot.